#80944 on display, July 24, 2004. Paul Swanson photo. #80944 on display, August 18, 2001. Ore by nature is heavier and denser than other bulk commodities such as coal, coke, or stone. Consequently, ore freight cars were specifically designed with four sloping sheets and a smaller cubic capacity. This was true from the first wooden ore cars that appeared in the 1870’s. At first the capacity was so light that the cars only had two axles, but later designs featured two trucks. 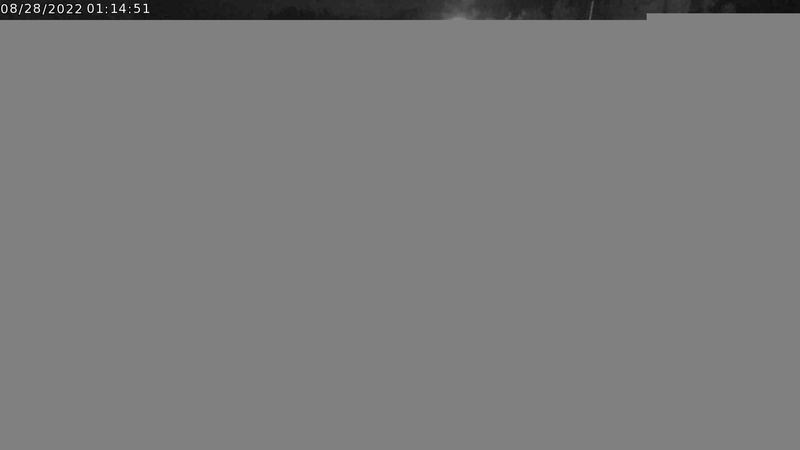 The first steel ore car was built experimentally about 1891 by George L. Harvey of Chicago patterned after exiting wooden cars of the time. Steel cars did not catch on until after 1900. The Chicago & North Western was a major ore hauler in the Midwest at the turn of the century. In 1904, it purchased its first steel ore cars. At the time, it rostered over 2,800 wooden ore cars. C&NW built its line from North Freedom to LaRue to serve an iron mine the year before. C&NW’s 20-ton capacity wooden ore cars were used exclusively on the line. After the ore mine closed, the line was extended another mile to a quartzite quarry. 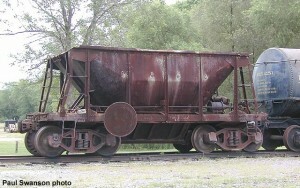 C&NW utilized steel ore cars in later years to haul out quartzite rock. The MStP&SteStM was also a major hauler of ore in the upper Midwest. Soo Line and its sister roads Wisconsin Central and Duluth South Shore & Atlantic rostered over 1,600 steel ore cars of a distinctive 50-ton “slanted-end” design to serve mines in Michigan, Wisconsin, and Minnesota. 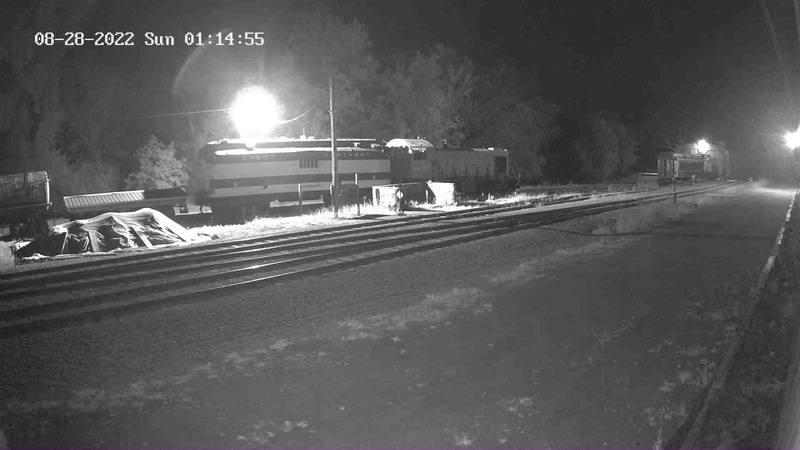 Soo Line #80944 is one of these cars. 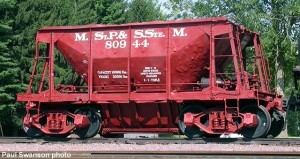 They were typically painted a mineral red (similar to boxcar red) with white lettering. Soo Line’s fleet could be found mixed in with other roads in pool arrangements with C&NW and Northern Pacific. #80944 was built for the Soo Line in 1916 by American Car & Foundry at their St. Louis plant. It was a group of 200 cars. In 1972 it was sold to Flambeau Papers in 1972. The car ended up at Fraser Paper’s Park Falls, Wisconsin plant, used for interplant storage. In 1997, the car was donated to the Soo Line Historical & Technical Society who in turn donated it to Mid-Continent. The car arrived at North Freedom in October of 1997. It has been restored to its Soo Line paint and lettering and is presently on display near the water tower as an example of steel ore cars that were once used by upper Midwest railroads.